Locked-in syndrome, a disorder characterised by complete paralysis and inability to speak, affects over half a million people worldwide. Children with locked-in syndrome are cognitively alert, but unable to interact with their environment either vocally or via motor movement. Recent research has demonstrated that many of these individuals exhibit residual voluntary functions such as yawning, tearing, or drooling. In local hospitals, such as Bloorview Kids Rehab, devices such as alphabet boards and simple switches are used to communicate with the locked-in who have residual movements, but no technology is available to communicate with those who are fully locked-in. The objective of this study is to develop a communication device for individuals who are fully locked-in. 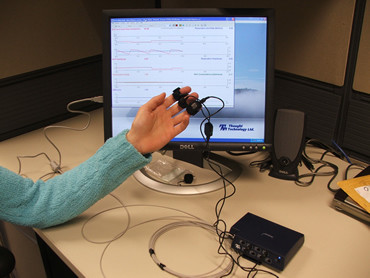 The investigators believe that an access point for subjects who are locked-in may lie in autonomic physiological signals that change with a subject’s mental and emotional state, such as electrodermal activity (the electrical properties of the skin), respiration rate, heart rate, and skin temperature (Figure 1). The study investigates whether different mental exercises can be used to generate a reproducible change in these physiological signals, signals that people who are locked-in could reliably control to use a communication aid. Various features of these autonomic physiological signals will be identified and investigated to either create a feature space (a multi-dimensional, identifiable pattern) or to train an artificial neural network to classify the subject’s mental state. It is hoped that this will enable the subject to answer yes or no questions, to use a communication aid, or to control their environment. There is a high prevalence of learned helplessness among children with severe disabilities due to their inability to control their environment. Providing locked-in children with a means of interacting with their environment, regardless of how simple, is essential to negate this effect and has the potential to substantially improve their quality of life.